The Bible is one of the most fascinating books ever written; the stories have stood the test of time. I'm not sure if all of the Bible should be taken literally, but I really want to believe that I can literally and figuratively walk on water, tell a mountain to move and it moves, be put into a fiery furnace and when I come out, not be burnt or even smell like smoke. Somebody knows what I am talking about. However, there is a quote from the Bible that I take literally, and it can be found in the Old Testament Habakkuk 2:2. From the English Revised Version it says "And the LORD answered me, and said, Write the vision, and make it plain upon tables, that he may run that readeth it." To write my visions for my life and make it plain, I decided to create a vision board. For those who don't know, a vision board is literally a poster board where I put words and images that convey the visions for my life: I have a lady running and doing yoga, I have the image of people laughing and talking etc. I have words such as What are you eating, Go to Ghana soon, and Meet and form a relationship with Toni Morrison. Meet and form a relationship with Toni Morrison. I know what you are thinking, but I really want to get to know this wonderful, bright writer, and I do believe that it will happen. Wednesday night, The George Washington University hosted a conversation with Toni Morrison. She came on the stage and instantly she was captivating. Her presence is enough to quiet an entire auditorium and put joy, amazement, wonder, and anticipation in a person's mind. Toni Morrison at The George Washington University: I'm loving that hat! She talked about her life and her books. She also read from her novel A Mercy. (There is nothing like hearing an author read her own words). Finally, she took questions from the audience! "The One that I'm Writing Right Now: Perfection"
This lady is deep! This answer almost took my breathe away. I really wanted to do one of those praise dances from back in the day. Being the person that I am, I started to think, "Why not apply this answer to life." Why not live with the idea that whatever we are doing right now is the best ever: my best pain, my best happiness, my best struggle, my best day, my best teaching, my best workout, my best RIGHT NOW: PERFECTION despite and inspite of the situation? One thing I know for sure is that RIGHT NOW is all that we have. Why not make it the BEST, RIGHT NOW! 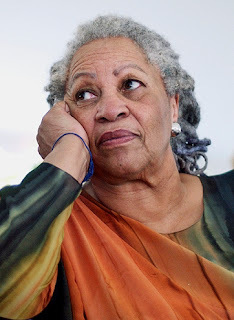 So, my vision of meeting and forming a relationship with Toni Morrison has not happened yet, but know that because I have written the vision and made it plain, I am going to do my part to make this happen. I promise that when I meet her, you, my readers, will get to read all about. Make today your BEST ever.